CONNOR KOCH (Emu) - My artwork is made out of cardboard with glued on bottle caps all over it and it is an emu. I was born in 2003, I am in year 8 at Broken Hill High School. Drawing is one of my favourite pass times. I started drawing at an early age spending a lot of time with my grandmother who is an artist so I was influenced. I love attending most of the workshops available both at Regional Art Gallery and West Darling Arts. My first oil painting was the “Mona Lisa” at the age of 10. I received 1st place at the silver city show. My second achievement was first in 2015 Young Archie Portrait Comp Far West NSW. Hosted portrait of my “grandfather” in pencil, category 9-12 years. My passion is doing portraits I am doing art this year at school and will be choosing it as an elective to further my studies. BENJAMIN MILLER (Cockatoo) - Often attends workshops at the Broken Hill Art Exchange. He enjoys drawing and does pencil drawing classes and Benjamin plans to take up painting classes next year. CAPRI HANCOCK & CRYSTAL JOHNSTON (Kangaroo) enjoyed themselves at the workshop and loved working with Caitlyn Sara at the Art Exchange. They learnt that mums rubbish is their treasure and found the exchange fun and welcoming. LOCATION: CrossFit Broken Hill 170 Crystal Street. - A physical fitness center and way of getting fitter and stronger in a community environment. In May 2017 emerging, local artist Caitlyn Sara conducted a workshop for young people as part of the Broken Hill Art Exchanges iStreet Youth Arts Scholarship for ages 8 and 16 years. Caitlyn encourages young artists to explore trash and nature, turning them into artistic masterpieces. 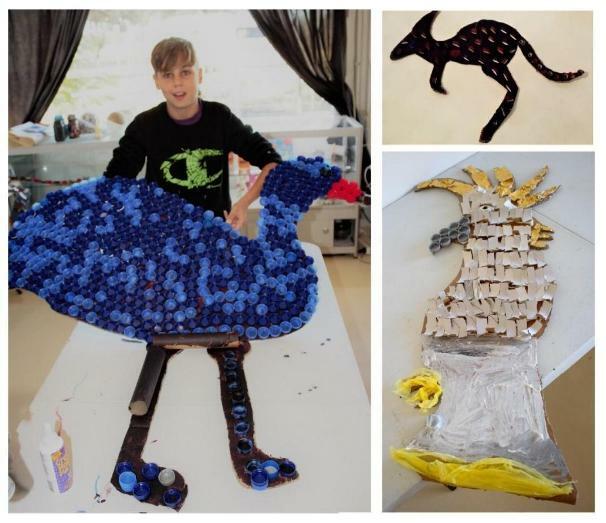 Students from the workshop produced artworks made from plastic bottle caps and other discarded household waste materials for the Desert Equinox Earth Art Prize. Participants: Connor Koch, Madalyn French, Deyonne Reiss, Bella Kolinac, Tan Bamrungphakdee, Mackenzie Tonkin, Eleana Geneblazo, Justin Materna, Amali Elston and James Cecchin. The iStreet Art Crew Scholarship program participants (10-15 years old) completed a giant chalk board mural titled the 'River'. The art work was best viewed through 3D glasses to gauge the full effect of the flowing river. The group exhibited the mural in the Broken Hill Fringe Festival in September 2016. The iStreet Art Group's artwork has been submitted into the Desert Equinox Prize Exhibition by their tutor, Gary Cook. Gary became interested in depth perception art through collecting stereo views (3D photography). His interest deepened when he discovered Chroma-depth © Glasses. His interest in 3D chalk art resulted from a Street Art Exhibition at Cockatoo Island, Sydney Biennale. He and his partner Beverly discovered chalk drawings on a footpath which turned into 3D when looking through the glasses. Over the past two Christmas periods he has conducted chalk art projects in Patton Street as part of a BHAE Inc. and Patton Village initiative. 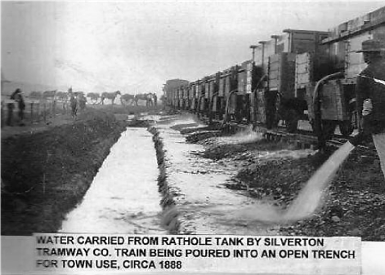 It was displayed alongside historical photographs kindly supplied by the Bank family. The historical photos introduced the idea of producing historical 'paste up' murals which serve as a tourist and educational attraction for Broken Hill, Australia's first heritage city, its historical buildings and events.